Hare Coursing...On a bitterly cold February day members of the Swaffham Coursing Club meet near Narborough, Norfolk. The judge on horseback monitors each course. 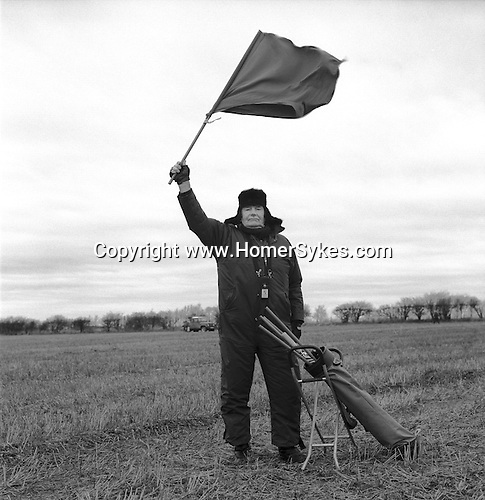 He carries with him a small red and white flag, which he waves to indicate to the flagman which greyhound has won. The flagman then flies the appropriate coloured flag...Hunting with Hounds / Mansion Editions (isbn 0-9542233-1-4) copyright Homer Sykes. +44 (0) 20-8542-7083. < www.mansioneditions.com >.